Cleverti | Blockchain: what's out there and what's next? Digital currencies have been on the market for a while and what begun a nerd idea has become mainstream. Bitcoin and Blockchain are in. Even people who have never understood how it works are talking about it these days and for sure you have already heard about Bitcoin and Blockchain. So, what is Bitcoin after all? Bitcoin was the first digital currency in the world exchanging without any kind of trusty nor centralized management, using the blockchain technology which only works via the Internet and nobody controls it. There is no central database to hack or shut down and the emission of the currency is executed through the work of millions of computers around the world. Although Bitcoin has attracted more and more attention over the last years, as it was the first killer blockchain app and may become a value similar to Gold, the blockchain technology is where the big potential transformation will occur, being considered the next internet wave. But what is a blockchain? In short, blockchain technology offers a way to reach an agreement between untrusted parties. It’s a list of records (blocks) linked together (chain), maintained as a distributed and decentralized database allowing a group of connected computers to maintain a single updated and secure ledger. This ledger can record immutable transactions between parties using the open network as the central authority. The advantages of this decentralized ledger are their certification (all the info is time-stamped), transparency (the information is available and anyone can verify the transactions), and decentralization (all the records exists on several computers). A blockchain is simply a shared and distributed ledger. The most well-known for now are the Bitcoin blockchain, which was the first blockchain implemented, and the Ethereum blockchain that brings the advantage of smart contracts and many other private and public blockchains. Since the Bitcoin was launched in 2008, thousands of other different cryptocurrencies (known as alternative coins or altcoins) have been launched using different rules and business models. From a business perspective, the blockchain concept allows to transfer assets across the Internet without the need for a centralized third party and could result in a radically different competitive future for several services as the next-generation of business software. 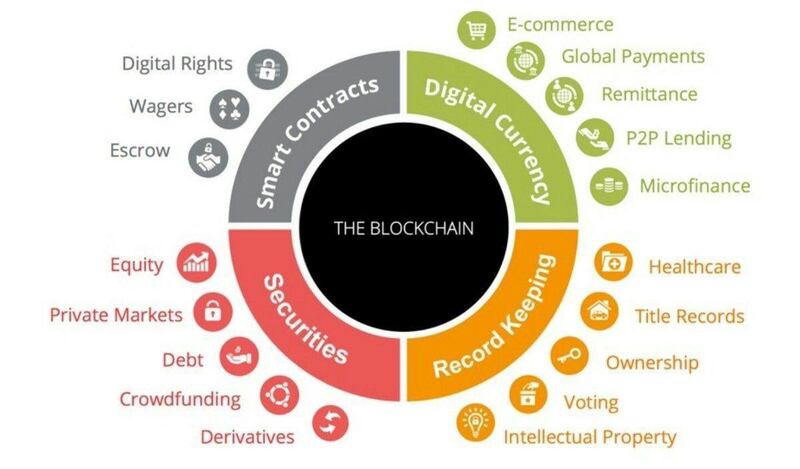 What are the major blockchain components? Redundancy - The blockchain is continuously updated and replicated across the network and there are no failure points. Immutability - All the data is connected on successive blocks encrypted together. Encryption - The information is authenticated based on private and public keys to identify which users own what and from where to the transactions are sent. The network as the kind of access and how it will be used and maintained by the users. The consensus protocol to define how we reach an agreement between the members of the network and the transactions are registered and verified to the blockchain, usually solving complex problems based on an incentive mechanism using competition between the nodes. Smart contracts are pieces of code developed on the blockchain that allow developers to build and deploy decentralized applications. Addresses are used to receive and send transactions on the network. Public — Completely decentralized and uncontrolled where no limit or access is required. Consortium — The process to add new transactions blocks is verified and controlled by a specific node or nodes. Private — The rights to access, read or modify the records is restricted to specific users or nodes. Proof of Work — Miners have financial incentives to process as many transactions as possible using computational power to solve a cryptographic “puzzle”. The miner that solves the puzzle, and therefore “mines” the new block to add to the chain, is rewarded by the network. A predefined amount of new coins is created and given to him, together with the transaction costs of all transactions contained in the block. When this puzzle is solved, the block can be added to the chain - on average, every ten minutes. This is the consensus protocol used by Bitcoin. Proof of Stake — Transaction validators receive rewards in proportion to the amount of their “stake” in the network. This improves network security by discouraging duplicitous attacks. PoS is more oriented to organizations with constrained computing power. The PoS consensus it the protocol that Ethereum will use. Closed Consensus - In a closed consensus mechanism some certain nodes are required to put up a security deposit in order to participate in updating the Blockchain. 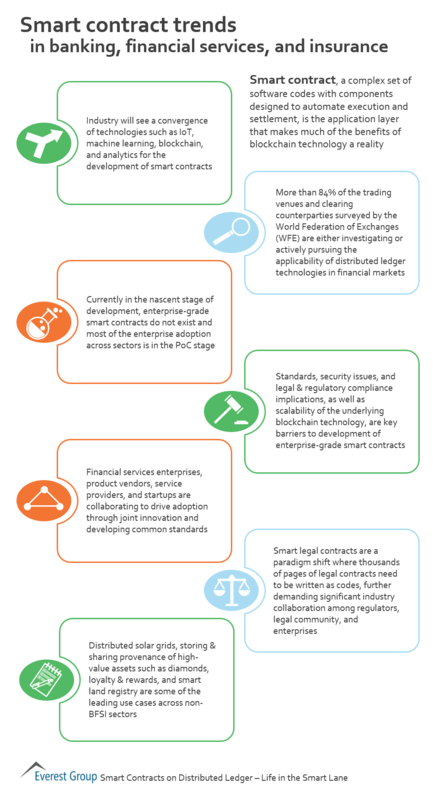 Smart Contracts are an important component for the future development of blockchain. Similar to Bitcoin, Ethereum is a blockchain-based system using the same concepts but brings the new idea of Smart-Contract. Ethereum was created by Vitalik Buterin, a 19-year-old Russian Canadian in 2013 to be the next generation Blockchain technology. As it is programmable, it allows users to develop and deploy their own applications with just a basic level of programming skills - These applications are called “Smart Contracts”. To “power” its operation uses its own currency called Ether and uses “Ethereum virtual machine” to run the system, and its own programming language called “Solidity”. Regarding the address, the key information is the private key - similar to a password where only those who own access to the balance are associated and can sign a transaction. The public key is then created from the private key using an elliptic curve based on some calculations. This public key is all the information needed to send and receive payments. You have your private key (similar to a password – private and only known by you) and your public key (similar to your username or identity – public, that all other users may know). To access your “wallet” and send x Bitcoins to another user you have to know the public key of the receiver. The transaction is sent to the network to be “registered”. The “nodes” of the network will register in the public and distributed ledger your transaction, “sending” your x Bitcoins to the receiver and keeping updated who owns what. Every ~10 minutes, all the transactions that were made around the world are put into a block of transactions bulked with the previous block. The “miners” who registered the block of transactions will compete against each other’s to solve this complex math problem to “discover” the correct result – hash. The “miner” who registered this block of transactions is rewarded with y Bitcoins (currently 12,5). The valid block of transactions will then be added to the chain linked to the previous blocks, creating a chain of blocks with all transactions made. Subsequently, all miners will start mining the next block. The chain is continuously updated across this distributed ledger and it is always possible to know who owns what at any time, as this distributed ledger has synchronized replicated databases visible to all the network. 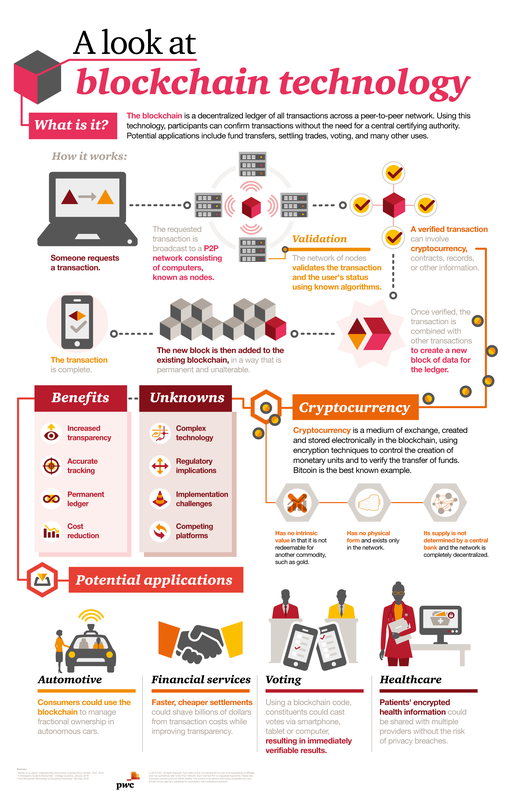 Blockchain can have a wide use that goes far beyond digital currencies or transfers. The potential of this disruptive technology is not only to change the way we use the Internet, but also the global economy and the world as we know it. The question of Privacy as the transactions can be sent and received anonymously. Although preserving the users’ privacy can be a support for illegal operations. The Volatility of prices, as the current currencies are presenting a strong volatility. The maturity of technology as new tools are born, bringing new services and features. Currently, we are on the internet of information era, where we use and exchange different pieces of data, but we’ll shift to the internet of value, that will be based on assets. Being distributed, this new economy based on the internet of value doesn’t need intermediates nor big operators to run as it is based on consensus and transparency and immutability. This is just the beginning. Many other applications will be invented and other features will come. No matter what the future brings, Cleverti will be here to help you – just let us know!